Lyca Productions- Superstar Rajinikanth-Akshay Kumar-Shankar Magnum opus SciFi action thriller 2.0 to be screened worldwide on April 2018. Nation's costliest 3D' film starring Superstar Rajinikanth, Akshaykumar, Amy jackson directed by Shankar, Music by AR rahman. The high-tech post production workd are fully geared and the team ia all set for the release schedule. Finally, Fans celebrates his thalaivar's movie release date announcement. 2.O movie story Written by S. Shankar, B. Jeyamohan, Cinematography by Nirav Shah, Edited by Anthony. 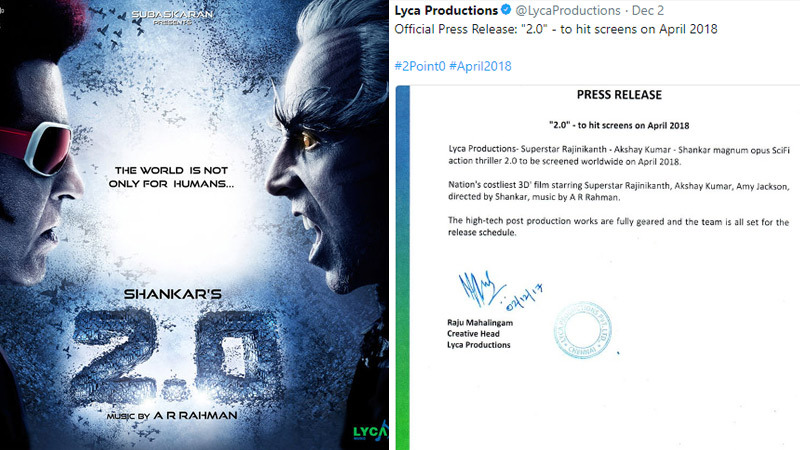 Write & Share about "Official announcement of 2 point O release date: Lyca Productions | 2.0 (2 Point O) Tamil Movie News | Cinema Profile" !